Shree Narayana Guru (1856–1928), also known as Shree Narayana Guru Swami, was a Hindu saint & social reformer of India. The Guru was born into an Ezhava family, in an era when people from backward communities like the Ezhavas faced social injustice in the caste-ridden Kerala society. Gurudevan, as he was known among his followers, led Reform movement in Kerala, revolted against caste system and worked on propagating new values of freedom in spirituality and social equality which transformed the Kerala society. Shree Narayana Guru is revered for his Vedic knowledge, poetic proficiency, openness to the views of others, non-violent philosophy, and unrelenting resolve to set aright social wrongs. Narayana Guru was instrumental in setting the spiritual foundations for social reform in Kerala and was one of the most successful social reformers to revolt against caste system in India. He demonstrated a path to social emancipation without invoking the dualism of the oppressed and the oppressor. The Guru stressed the need for spiritual growth and social upliftment of the downtrodden by the establishment of temples and educational institutions. In the process, he brushed aside the superstitions that clouded the fundamental Hindu religious convention of Chaturvarna. Shree Narayana Guru was born on August 20, 1856, in the village of Chempazhanthi near Thiruvananthapuram as the son of Madan Asan, a farmer, and Kutti Amma. He was dotingly called Nanu. Madan was also a teacher, learned in Sanskrit and proficient in Astrology and Ayurveda. He had three sisters. As a boy, Nānu would listen to his father with keen interest when he narrated stories from the Ramayana and the Mahabharata to the simple folks of his village. Nānu was initiated into the traditional formal education Ezhuthinirithal by Chempazhanthi Pillai, a local schoolmaster and a village officer. Besides schooling, young Nānu continued to be educated at home, under the guidance of both his father and uncle Krishnan Vaidyan who was a reputed Ayurvedic physician and a Sanskrit scholar, where he was taught the basics of the Tamil and Sanskrit languages and traditional subjects such as Siddharupam, Balaprobhodhanam, and Amarakosam. As a child, Nanu was very reticent and was intensely drawn to worship at the local temple. He would criticise his own relatives for social discrimination and the apartheid-like practice of segregating children from, supposedly, lower castes. He preferred solitude and would immerse in meditation for hours on end. He showed a strong affinity for poetics and reasoning, composing hymns and singing them in praise of God. He lost his mother when he was 15. Nānu spent his early youth assisting his father in tutoring, and his uncle in the practice of Ayurveda, while devoting the rest of his time for devotional practices at the temples. The young Nanu had a keen mind and was sent to a famous scholar, Kummampilli Rāman Pillai Asan at Karunagapally, a village fifty miles away from his home, at the age of 21. Living as a guest in a family house Varanapally near Kayamkulam, Nānu, along with other students, was taught Sanskrit and poetry, drama & literary criticism, and logical rhetoric. He also studied the Vedas and the Upanishads. He began teaching at a near-by school. The knowledge gained earned him the respect of many and he was then known as “Nanu Asan”. Nanu returned home to spend some time with his father, who was on the death bed. For a short period, he ran a village school for the neighborhood children. While continuing his quest for “the ultimate truth”, Nanu would often spend time in the confines of temples, writing poems & hymns and lecturing to villagers on philosophy and moral values. Under pressure from the family, Nanu married Kaliamma, the daughter of a traditional village doctor. The marriage was a simple affair with the groom’s sisters themselves investing the bride with the ‘Thaali’ (wedding knot) on his behalf. The bride remained with her parents since Nanu became a wanderer not long after. After the demise of the father and wife, Nanu Asan continued his life as a wandering Sanyasi. He became a ‘Parivrajaka’ (one who wanders from place to place in quest of Truth). It was during one of these days that Nanu met Kunjan Pillai, who later came to be known as Chattampi Swamikal. Kunjan Pillai, who discovered and appreciated Nanu Asan’s philosophy and passion for Yoga, introduced him to Thycattu Ayyaavu, a ‘Hatha yogi’. Under the Yogi, Nānu Āśān mastered various Yogic practices including Hatha Yoga. The exposure gained from these scholars had a lasting impact on the later life and philosophy of Nārāyana Guru. Nanu Asan moved to his hermitage deep inside the hilly forests of Maruthwāmala, where he led an austere life immersed in meditative thought and yoga and subjected himself to extreme sustenance rituals. This phase of solitude lasted for 8 long years. After an unpretentious life of over thirty years abounding in knowledge and harsh experiences, this epoch is considered the culmination of the meditative recluse; the point at which Nārāyana Guru is believed to have attained a state of Enlightenment. 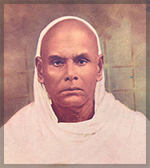 Narayana Guru’s later literary and philosophical masterpiece Atmopadesa Satakam (one hundred verses of self-instruction, written in Malayalam circa 1897) is considered a fertile poetic expression, encapsulating the Guru’s philosophy of egalitarianism, emanating from the author’s attainment of an experienced state of primordial knowledge and quintessence of the Universe; and his ensuing ability to view the human race, from a dignified and elevated perspective, as nothing but one of a genus, in unqualified equality and without any racial, religious, caste or other discrimination whatsoever. A new phase began in the Guru’s life in 1904. He decided to give up his wandering life and settle down in a place to continue his Sadhana (spiritual practice). He chose Sivagiri, twenty miles north of Thiruvananthapuram. Goddess ‘Amba’ became his deity of worship. Next, he started a Sanskrit school in Varkala. Poor boys and orphans were taken under his care. They were given education regardless of caste distinctions. Temples were built at different places – Thrissur, Kannur, Anchuthengu, Tellicherry, Calicut, Mangalore. A temple was built for Sharada Devi in 1912, at Sivagiri. Worship at such temples helped reduce to a large extent superstitious beliefs and practices. 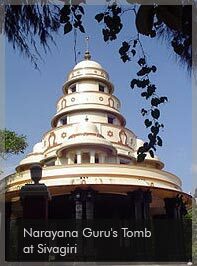 One of the temples built in Thrissur is the Shri Narayana Temple at Koorkenchery. The temple has a school in its compound named Shri Narayana School. The School encourages students’ talents by organizing talent competitions. These competitions, regularly held every year, have been a platform for youngsters to stand up and recognize their talents. In 1913, the Guru founded an Ashram at Aluva. It was called the Advaita Ashram. This was an important event in the life of the Guru. The Ashram was dedicated to a great principle – Om Sahodaryam Sarvatra (all human beings are equal in the eyes of God). In 1921, a Conference of Universal Brotherhood was held at Aluva. Again in 1924, a conference of all religions was held there. The Guru stressed the need for a Brahma Vidyalayam for the comparative study of various religious faiths. An institution called Narayana Gurukulam was established in the Nilgiri Hills, Tamil Nadu by Bodhananda Swamikal and later handed over to Nataraja Guru. Gurudevan visited Ceylon in 1926. He had some moving experiences while traveling in Tamil Nadu in connection with his journey to Ceylon. While he was in Shree Ganapathi temple in heavy rain he said, “If there is anyone writing my biography, these experiences should not be missed, they should be recorded.”After that journey to Ceylon, Gurudevan did not want to return. He went back only after repeated requests of his disciples and devotees. In a message to the Shree Narayana Dharma Paripalana Yogam in 1926 Gurudevan declared, No community can make progress except through organization. He further said in that message the name Ezhava does not denote a caste or a religion and he made temple rights to everyone. Therefore people can be admitted to this organization without paying heed to differences of caste. On June 14, 1927 Shree Narayana Guru consecrated a mirror – with the message “Om shanti” written on the surface – in a temple in Kalavankode. The prathishta of the mirror is symbolic in that Advaita Vedanta interpret the mirror as the visible symbol of the unity of the Finite and the Infinite. That was the last prathishta that the Guru would do. Schools rather than temples are to be preferred, he exhorted in a dramatic shift of focus. Gurudevan participated in the anniversary of the Shree Narayana Dharma Paripalana Yogam held at Palluruthy in 1927. It was a splendid meeting which demonstrated the sincere, devout faith of the people in Gurudevan. T. K. Madhavan was one of the chief architects of this meeting. In 1928 Gurudevan took part in the special meeting of the Shree Narayana Dharma Paripalana Yogam at Kottayam and gave away registration certificates to the branch organizations. Sivagiri pilgrimage was conceived by Vallabhasseri Govindan Vaidyar and T K Kittan Writer. It was duly approved by Gurudevan on January, 1928. The setting was SNDP’s Nagambadam Shiva temple. It was 3 pm and Gurudevan was resting under a mango tree when the two presented the concept of Sivagiri pilgrimage. Before giving his blessings he set out the goals of such a pilgrimage. He said: “Let the pilgrims congregate at the beginning of the Gregorian calendar year. It should be Dhanu, 16-17 in Malayalam calendar. Let the pilgrims observe 10 days self-purification according to Sri Buddha’s principles of five purities – body, food, mind, word and deed called as Pancha Dharma. Finally, it was decided to start the first pilgrimage from the village of Elavumthitta in Pathanamthitta District. The SNDP of Elavumthitta selected 5 youngsters for the pilgrimage, namely, P.K.Divakara Panicker, P.K.Kesavan, P.V.Raghavan, M.K.Raghavan & S.Sankunni. All the 5 pilgrims wore bright yellow dress, as suggested by Shree narayana Guru. All the way to Sivagiri, they were reciting ‘Swaathanthrya gadha’ – written by the great poet Kumaranaasan. They were teased with the words ‘Manjakkilikal’ –meaning yellow birds. They never got provoked, with a smile they moved on. The dominant thought in their mind was the mission to fulfil, will have to reach Sivagiri, a great responsibility bestowed on their shoulders by the Shree Narayana devotees. Their mission was a great success. Today thousands are following the way they had shown. The Palluruthi event in 1927 was the last anniversary of the Yogam which Gurudevan attended. It was also the last public function Gurudevan attended. Guru became seriously ill in September 1928. He remained bedridden for some time. Devotees came in large numbers to have a glimpse. The same year, Gurudevan’s birthday was celebrated in many places, mostly in Kerala, Madras, Mangalore, Srilanka and Europe. On 20 September, Guru died. Commemorative coins issued by the Reserve Bank of India in 2006 on the occasion of the 150th birth anniversary of Nārāyana Guru. Nārāyana Guru, however, disagreed, and voiced his tolerance for those who converted to other religions, with the argument that one should follow what one truly believes in. He also questioned the logic of Gandhi’s argument, arguing that caste in India was a socio-economic issue. Nārāyana Guru has been conferred many formal recognitions and honours by the State, intelligentsia and society. In 1901 the State Census Manual of Travancore recorded Shree Nārāyana as a revered “Guru” and an erudite Sanskrit scholar. A sharp drop in the statistics of the commission of crime was also attributed to the correcting and moralizing influence of Nārāyana Guru on the society. In 1904, the then Maharajah of Travancore exempted Nārāyana Guru from personal appearances in court, an honour recognizing the Guru as a distinguished living personality. Malayala Manorama cover spread on 31 December 1999 naming Nārāyana Guru as ‘Malayalee of the Century’. The first statue of the Guru was conceived by Moorkoth Kumaran and sculpted by an Italian sculptor Prof. Tavaroli whilst the Guru was still alive. The bronze statue, which took 14 months to complete, was installed at the Jaggannaatha temple at Thalassery and unveiled on 13 March 1927, after the consecration of the statue by Bodhananda Swamikal, the disciple and then spiritual successor-designate to Nārāyana Guru. and spiritually organized communities worldwide. Jagadguru Swami Sathyananda Saraswathi,the renowned spiritual teacher reckoned as the greatest karmayogi to uphold Sanatana Dharma since Swami Vivekananda drew inspiration from the Guru’s life and teachings and popularised it through his long oratories across the length and breadth of Kerala. He can be regarded as a political successor of the guru who enshrined the guru’s vision in the setting up the Hindu Aikya Vedi uniting all the Hindu organisations in Kerala under the aegis of a single organisation brushing aside caste distinctions and uniting the two major groups of Hindus in the state, the savarna Nairs and Ezhavas. All across the State of Kerala, and outside the State, hundreds of small chapel-like Guru Mandirams are devoted to the reverence and worship of Shree Nārāyana Guru. Most recently, a distinctively styled iconographic statue of Nārāyana Guru named the Jnana Vigraham was conceived and created by a team of artists, as a suggestive model for the future, to improve the aesthetic quality of statues of Nārāyana Guru kept in homes and placed in Guru Mandirams worldwide. The International Center for Shree Narayana Guru Studies was established in 2005. On the website, the Center attributes 20 miracles to him. The Shree Narayana Jayanthi, a birthday of the Guru, and the Samadhi day are befittingly celebrated in August and September respectively every year. On these days colourful processions, seminars, public meetings, cultural shows, community feasts and special rituals are held. In the last week of December, devotees of Sree Narayana Guru, donned in yellow attire stream to Sivagiri from different parts of Kerala and outside, in what may be called a pilgrimage of enlightenment. Seminars and discussions on various themes of modern life ranging from industrialization to women’s emancipation are held during the days of pilgrimage. The Mahasamadhi of Sree Narayana Guru also attracts a large number of devotees and tourists.